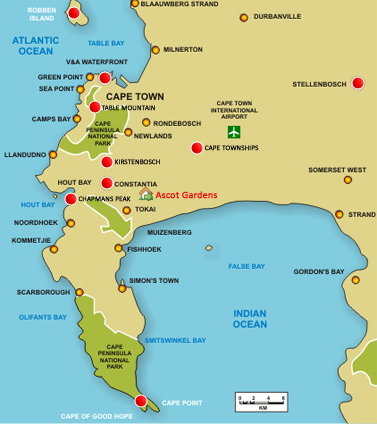 Ascot Gardens is convenient to the Constantia Wine route, False Bay, Cape Town Airport and the Southern suburbs of Cape Town. Ascot Gardens is situated in the quiet peaceful suburb of Bergvliet in the Constantia Valley. We are centrally located to enable you to easily visit all of Cape Town's many tourist attractions.